The French composer Delerue (1925-1992) is known for his success in film music. This disc serves as an introduction into his lesser known classical works, featuring violin, cello and percussion paired with piano. The short, beautiful Antienne 1 for violin and piano sets the tone for the whole disc. Thouin’s approach to this simple piece is clean and honest. Concerto de l’Adieu was originally for violin and orchestra but appears here with piano. Something is lacking, and the writing has a meandering tendency. Aria et Final for cello and piano feature some interplay that is both interesting and jarring. Cellist Guillaume Saucier plays stiffly and the ensemble offers little in the way of emotional connection. The Final is disappointing and lacks energy. Marandola steals the show with Mouvements pour instruments à percussion et piano. After more standard arrangements of strings and piano, the inclusion of percussion is quite refreshing. In addition, Marandola’s variety in colour and subtle dynamic shifts makes for an enthralling performance. The disc is capped off with Stances for cello and piano and Sonate pour violon et piano. 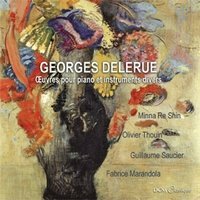 For 20th century music Delerue’s writing is very accessible, but the longer works may leave you wishing there was video included.